Local government units resort to external repayable sources of financing their own activity, mainly those connected with investments, when the financial sources they have at their disposal are insufficient. However, owing to an unfavorable financial situation, some of them lose their creditworthiness because their debts exceed the legal limit. In such a situation, they decide to use the so-called unconventional instruments, which, although they provide certain long-term benefits, in a longer time perspective lead to negative consequences, connected mainly with diminished financial liquidity and the necessity to bear inflated costs of debt service. The aim of the paper is to present the reasons for using unconventional instruments of financing budget needs by decision-makers, as well as their specific character and economic effects, particularly as regards the financial stability and security of LGUs, the transparency of local finances and the related hazards. The achievement of this aim required analysis of the literature devoted to the subject, reports of controlling institutions and statistical data regarding the debt level of LGUs. Optimum. 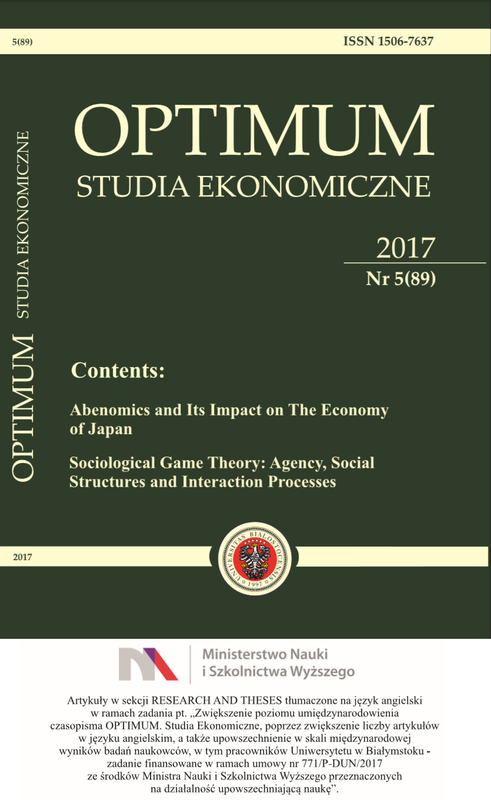 Economic Studies na liście 100 najpopularniejszych czasopism naukowych w Polsce wg Google Scholar 2018.